Here some suggestions for creating plant tags for your demonstration garden by printing on shipping labels using a mail merge application. – Mail merge into Word, etc. Choose label size, design content. 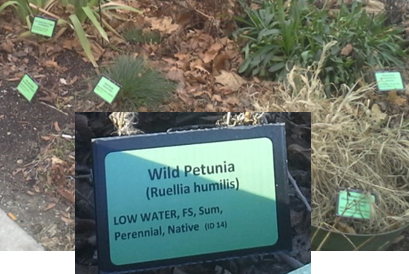 A plant picture in each label is possible, but is more work. Enter data into spreadsheet. Set up mail merge for the labels. Use MS Word, Google docs, etc. Use a template to simpify this step. Ask for help if needed. Choose a background color. It’s easiest to print the background colors Not much is available for waterproof labels that are not white. Print the labels. Laser printing is water resistent, inkjet is not. Staples, Fed Ex Office, etc. use laser printer/copiers. Color is about $.60 – $.70 per sheet (4″x2.5″ labels: 8 labels per sheet). Cut plastic. Probably a utility knife is easiest. Some paper cutters work as well. Add labels and seal. Press the labels onto the plastic backing. Sealing the labels provides extra weather protection and reduces the effects of UV light. Greenhouse plastic is one good solution. There are also different sprays and liquid laminates available, such as Krylon Acrylic UV Resistent Coating. If you used an inkjet printer, spray with a “fixer” before sealing. Add legs. There are several options for the wire legs. 1) Roll of wire — can be straightened. 2) landscape staples. 3) landscape flags — remove the flag, consider painting first. This method can be used with a cost as low as $.50 or so per plant tag.